This is part two of a three parts jQuery Mobile Tutorial. For introduction to the Tutorial please refer to Part I. In Part I we developed simple static pages which form a foundation of the application we are building. In this part, we will start adding dynamic functionality. The application will allow you to maintain a list of your favorite websites and share sites from the list with other mobile users through QR codes. Feel free to use any websites you like instead of the two included above. At this point navigation between the Home page and QR Code page should be working. We are ready to start adding dynamic functionality. Parameters are encoded. In Part III we will handle encoding in the application code. For now, since we are hardcoding the site list, we are manually encoding the url parameters. To find out more about dynamically injected pages please click here. 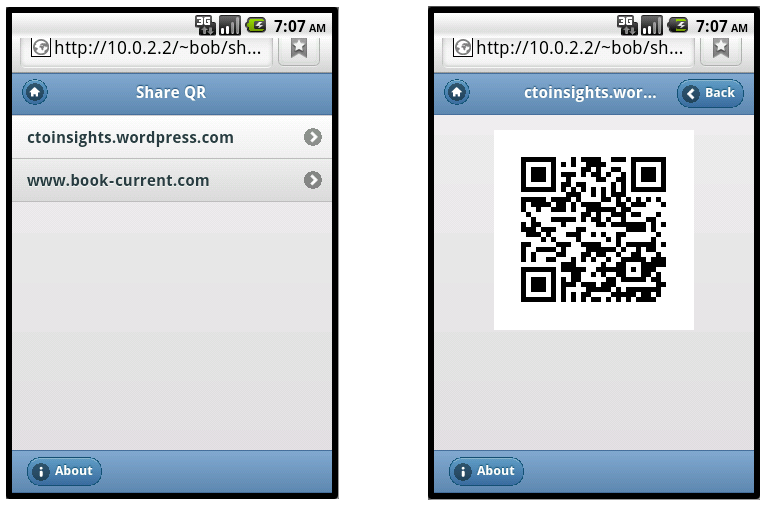 We also added a small css file to center display of the QR code. In Part III we will add site list management capabilities and complete the application. I’ve just started learning jquery mobile. Could you please explain what does this function u.hash.search does. u is an object returned by a call to $.mobile.path.parseUrl() method. It is documented at http://jquerymobile.com/test/docs/api/methods.html. u.hash is a fragment of a url including ‘#’ character. Hashes are used to identify “pages” stored within a single html file. u.hash.search simply compares current hash against a page hash such as #about to identify which page is currently requested. For example (u.hash.search(home) !== -1) is true when a currently requested page is the home page.